Russian wheat aphid (RWA) was initially found in South Australia and Victoria in 2016, and was subsequently found in NSW and Tasmania. In spring 2018 new detection's of RWA have been reported around Cowra, Forbes, Condobolin and as far north as Coonamble, Coonabarabran and the Liverpool Plains. 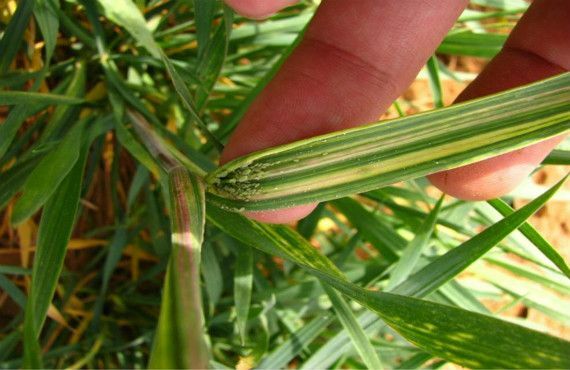 Grain growers and consultants across NSW are urged to monitor cereal paddocks for signs of RWA in order to manage infestations effectively. For information regarding current distribution, see the Cesar Russian wheat aphid portal. Russian wheat aphid (Diuraphis noxia) is a major field pest of wheat and barley in many grain producing countries. Yield losses of up to 80% in wheat and 100% in barley have been reported overseas. RWA injects toxins into the plant during feeding which stunts plant growth. Heavy infestations may kill plants. Russian wheat aphid can spread by wind, movement of machinery and vehicles, and on people’s clothing. RWA has a wide host range on grasses (Poaceae family). Primary hosts for RWA support the entire lifecycle and allow reproduction to occur. These include wheat (Triticum aestivum), barley (Hordeum vulgare), and durum wheat (Triticum durum). Secondary hosts are plants that support adults and final instars only. These hosts allow the aphid to survive but not to reproduce. Secondary hosts include oat (Avena sativa), rye (Secale cereale) and triticale (X Triticosecale). While many grass species are considered hosts of RWA it is not known which native Australian grasses are suitable hosts. Russian wheat aphid may be present in mixed populations. If aphids which are commonly found in cereals are observed it should not be assumed these are the only ones present. 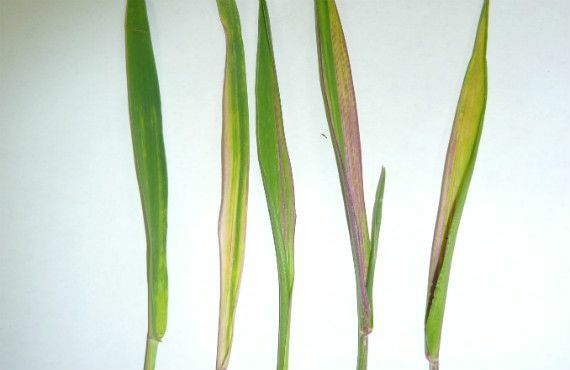 Detection of RWA is most likely by seeing symptomatic plants. 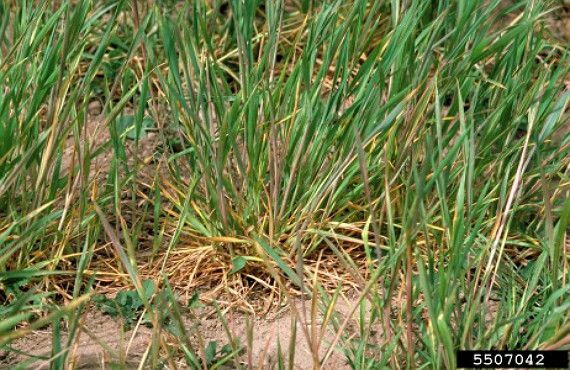 Scout for symptomatic tillers in host crops and inspect for aphids. Russian wheat aphid is very small (less than 2 mm) and a 10x magnification hand lens can be used to examine them. RWA appear quite different to other cereal aphids. They are generally light green in colour, with an elongated body shape, distinctive black eyes and lack visible ‘exhaust pipes’ (siphunculi). 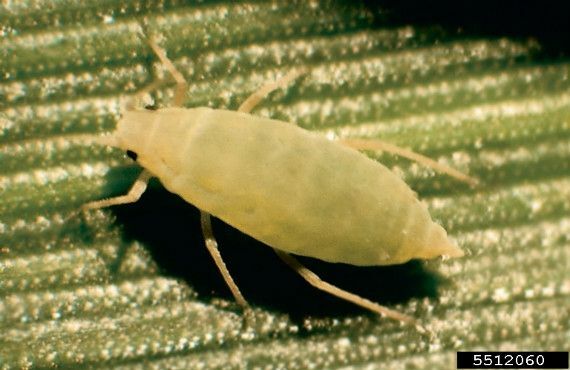 Russian wheat aphid is no longer a notifiable pest, however DPI is still interested in reports of RWA sightings in NSW (in particular northern NSW) and can provide diagnostics. An aphid sample may be required for accurate identification. Sample suspect plants, ensuring they are infested with aphids. Do not include roots and soil with sample. Samples should be placed in sealed container, vial or plastic ziplock bag with triple packaging (e.g. vial with 2 layers of plastic ziplock bags). Place packed sample in the fridge overnight to kill aphids prior to posting. It is important to put hygiene practices into place to reduce the risk of transporting pests and diseases on clothing, footwear, vehicles and machinery when moving between paddocks and farms. If symptoms of suspected RWA are observed it is important to change clothing (including hats) and clean footwear and vehicles before entering another paddock or farm. People entering crops should consider wearing disposable coveralls and changing these between farms. Used coveralls should be bagged and securely disposed of. Clothing worn in a suspected infested crop should be bagged, sealed and washed before being worn again. If chemical control is required, the Australian Pesticides and Veterinary Medicines Authority (APVMA) has issued a permit for the use of chlorpyrifos (permit number 83140) for the control of Russian wheat aphid. Refer to the APVMA PubCRIS database for the most up to date labels. Chemical control should consider economic thresholds, insecticide resistance in other crop pests, natural pest enemies and beneficial insects as part of integrated pest management. GRDC has released a comprehensive manual to guide Australian grain growers and advisers on best management practice to minimise the economic impact associated with infestations RWA. Refer to APVMA for information on seed treatments, registered and under permit.